Geo-environmental study on mangrove swamps in some localities along the Red Sea coast of Egypt. Farrag M. M. S.; Osman A. G. M.; Mehanna S. F.; Osman Y. A. A. Some biological aspects and population dynamics of the gilthead sea bream from Bardawil lagoon, Sinai, Egypt. 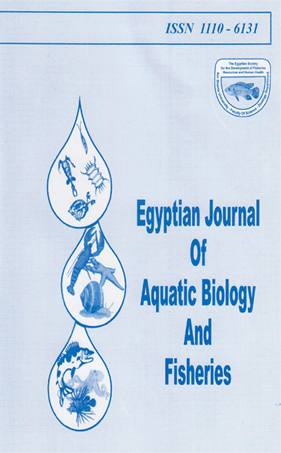 Pathological impacts of environmental toxins on Oreochromis niloticus fish inhabiting the water of Damietta branch of the River Nile, Egypt. Eutrophication assessment using TRIX and Carlson’s indices in Lake Mariout Water, Egypt. Restriction Fragment Length Polymorphism (RFLP) and Morphometric Studies of Two Morphologically Confused Crabs from Abu Quir, Alexandria, Egypt. Rady A.; Sallam W. S.; Abdou N. E. I.; El-Sayed A. A. M.
Length-weight relationship, condition factor and reproductive biology of the Thin-lipped grey mullet, Liza ramada (Risso, 1826) in Bardawil Lagoon, North Sinai, Egypt. Bioremediation of Fe, Zn and Cd ions from aqueous solution using died cells of cyanobacterial mats from extreme habitat, Siwa Oasis, Egypt. Mohamedin, A. H.; Mowafy, A.M.; Elsayed, A.A.; Ghanim, S. O.